These fantastic life-size cattle models are one of our most popular ranges. The detail of modelling on these life-size cows, calves and bulls is of a high standard when compared to some that you will see on the internet. 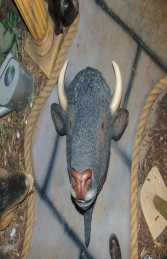 All our life-size animal models are made of high quality, durable, cold-cast poly resin and fibre-glass. Our cows can be found all over the country, from cattle feed companies who have used them for promoting at agricultural shows, to individuals who want something a little different for their gardens. Please go to our gallery section to see pictures of the cows with their proud new owners. The standing life-size cows come in two stances; head-up and head-down they are available either with or without horns (polled). Our calf model is ideal to combine with one of the cows to make a family group. There is also a lying-down cow and a lying-down cow bench. The cows illustrated on these pages are the standard black and white friesians, but we can supply to order (lead time of approx 12 weeks) cows in any breed colours eg South Devon, Jersey, Charolais or the cow models can be supplied plain so you can paint your own as they do in the cow parades all over the world. The bulls are available to order in any breed colour. If you are looking for something really unusual, have a look at our 'COW CHARACTERS' where you will find cows you never knew existed!